Today's installment in the 30 Days of Food challenge was super easy. That is a requirement for me as the week draws to an end. It's also fresh and light. It is the perfect meal for a picnic on a warm day and it is waistline friendly. What more do you need (besides a slab of sheet cake and a fork? Is that just me? Don't judge. It's only day 5 of my Six Week Grind). The recipe, adapted from Skinnytaste, is below. The original recipe is here. Happy Friday! Make the noodles using a spiralizer. You can also use a mandolin or a tool to cut veggies into julienned slices. Put noodles into a large bowl and add olive oil, garlic, lemon juice, salt and pepper. Stir until well combined. 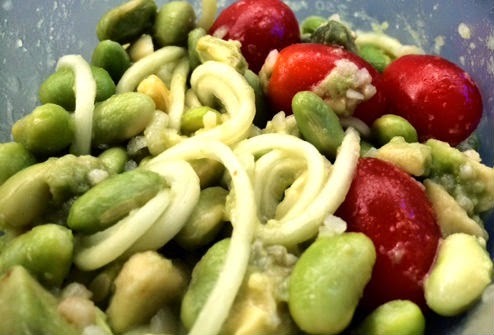 Toss in avocado, edamame and tomatoes until well combined. You can serve immediately or place it in your fridge to let the flavors marry for 30 minutes to an hour. Serve cool or at room temperature.